Chabad Welcome Back BBQ ’15. Photograph courtesy of Chabad at Brandeis. 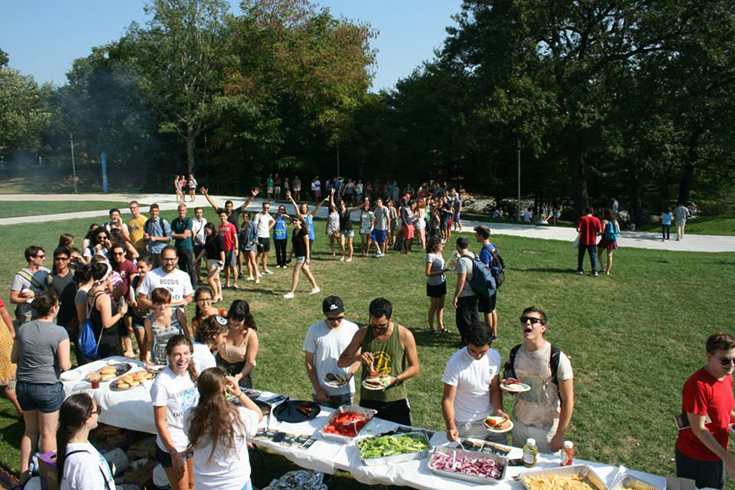 There are more than 260 student clubs and organizations at Brandeis University. Filling every niche from Quidditch to a capella clubs, Brandeis clubs offer a safe space and a home for students with similar interests. There are several clubs based in religion and religious culture where Brandeis students are welcome to worship, practice, and join in a community of like-minded individuals. As of summer 2016, the following clubs are present and active at Brandeis University. Chartered clubs “are also recognized by the Student Union Senate. However, they may not duplicate the purpose of any already Chartered Club or discriminate in their membership. Chartered Clubs may request money from the Union Allocations Board. To be chartered, a club must obtain the signatures of 15 prospective members and 135 supporters (totaling 150 signatures).” Clubs that are not affiliated with the Brandeis Student Union are unrecognized. Some clubs also are affiliated with umbrella organizations. These clubs are either associated with Brandeis Hillel (Hillel-affiliated clubs) or the Brandeis Intercultural Center (ICC-affiliated clubs). These clubs, in addition to being recognized, chartered, or unrecognized by the Student Union, operate within the organizational structure of Hillel or the ICC, respectively.